Based on the play by Tim Whitnall and starring Alex MacQueen and Philip Campbell, The Hide tells the story of a reclusive bird watcher who spends his time on desolate marshes. His peace is disrupted by the arrival of a stranger whose dishevelled appearance initially causes him some alarm. Surprisingly, the pair strike up a friendship, discovering that they have more in common than they first thought. However a shocking police announcement on the radio throws the two friends into a deadly fight for survival in this tense thriller. 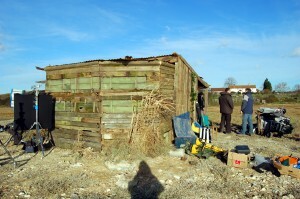 The Hide was erected on the marshy shores just below the Harty Ferry Inn. Other footage was shot a little further along at the Elmley Marshes on the Isle of Sheppey. Exposed to the elements, the bleak and atmospheric coastal marshland was the perfect backdrop for this tense thriller. Elmley Marshes is a little bit of wilderness located on the shores of the River Swale and is home to many unusual species such as the Avocet and the Marsh Harrier making it an ideal spot for twitching and indeed a film about a bird twitcher! 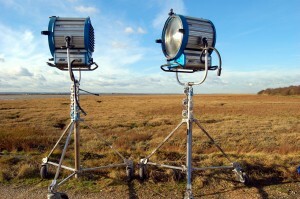 The marshes have previously been used by productions such as Jekyll and Hyde (2015), Great British Railway Journeys (2014) and A Taste of Britain (2014). The film was well received on the film festival circuit, making the official selection at the Dinard Film Festival and has recently been acquired by Film4. The Hide was released in cinemas in 2008 and is now available on DVD. This entry was posted in Filmed in Kent and tagged Elmley Marshes, feature film, Harty Ferry Inn, The Hide film locations. Bookmark the permalink.